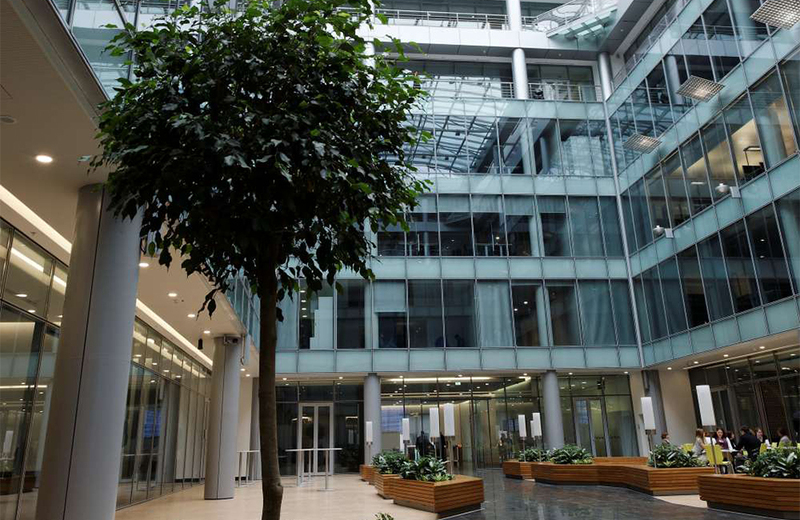 The leaders of «Siemens» decided to combine several disparate offices and acquired a modern 6-storey building with a two-level underground parking on the Bolshaya Tatarskay st., in the center of Moscow. In addition to developed infrastructure and proximity to Paveletskaya train station the buildings’ spacious atrium caught the attention of the future owners. And so ABD architects began their work on interior design beginning with the atrium. At the end of the atrium is a multimedia wall and a bar and around the whole area there are custom-designed bench-cupboards with live plants. These mobile pieces, which also include lamps and sockets for connection, can be easily removed fr om the atrium for a conference or a party. In the right wing there is a large meeting room area with a separate reception desk and in the left wing there is a spacious dining room with tables occupying some space of the atrium. To the right of the multimedia screen architects planted a live tree - it will grow and evolve along with the company. The second, third, fourth and fifth floors represent working open space. There are mobile units (2.7 x 2.7 m) called «stinktenki» (Russian play on the work «think tank»). In fact, these are enclosed meeting rooms that can be moved when needed for a particular workgroup. Initially, they were to move on wheels, however that design proved to be too costly. Consequently, stationary walls and a special type of ceiling had to be used, thus limiting the movement of the module, to provide access to the HVAC systems. Two of the walls of the module are painted in orange or green (depending on the floor: on even green dominates, on odd its orange) and the other two are made of clear glass with a pattern resembling birch tree trunks. In the work area there are a number of interesting solutions: mobile file archives, that are easily wheeled to the desired table, individual cells, wh ere, if necessary, baggage can be hidden and brightly colored sofas with high sound-absorbing back. To complete the picture, it must be mentioned that there also are coffee points, areas for blitz-meetings and plenty of hot desks. Furthermore, almost all work desks are equipped with a lifting mechanism, which enables you to work both sitting and standing. The lighting solution requires special attention. Architects almost completely abandoned the standard build-in ceiling lights, instead installing floor-standing luminaries with occupancy sensors. Only in a few corridor areas LED down-lights are used. All this led to significant energy saving, enabling Siemens to claim the prestigious international certification LEED (Leadership in Energy and Environmental Design). VIP-zone is located on a small part of the sixth, top floor and is comprised of a reception, combined with a bar, CEO and CFO offices, two meeting rooms (one convertible), a lounge area and assistants’ works spaces. Graphics resembling birch tree trunks is used in this area as well. So is it possible to comply to all the requirements of the harsh corporate style and avoid the standard, boring solutions? It turned out you can, without any contradictions. Of course, corporate standards severely restrict architects’ creativity, but mindless adherence to pre-prepared recipes is not enough for success. For the creation of memorable, innovative interior deeper, technically sophisticated solutions are needed. And it’s great the there is someone in Russia to implement such projects. ABD Architects managed the designs works on the highest level as well as architectural supervision and some additional services. 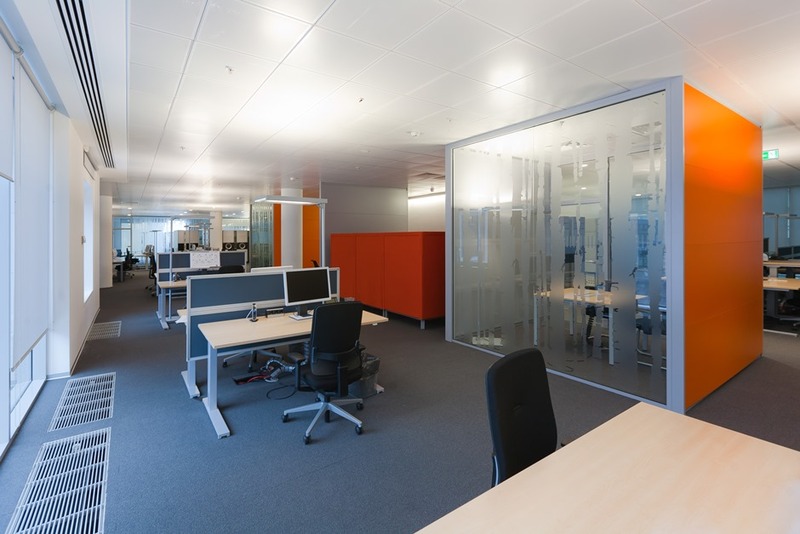 We are very pleased with the style of the working process which helped to create space efficient layout and Design of the office which fits the high standards of Siemens. The space planning and design solutions developed by ABD Architects are in line with the most up-to-date trends in office interior design and at the same time create very comfortable, friendly and business-supporting atmosphere for our people. In May 2011 our project received the Best Office Award in the category “The best organization of the office space”. The design was also developed in line with the Green building standards and we are expecting the receiving of LEED Gold certificate in September 2011.